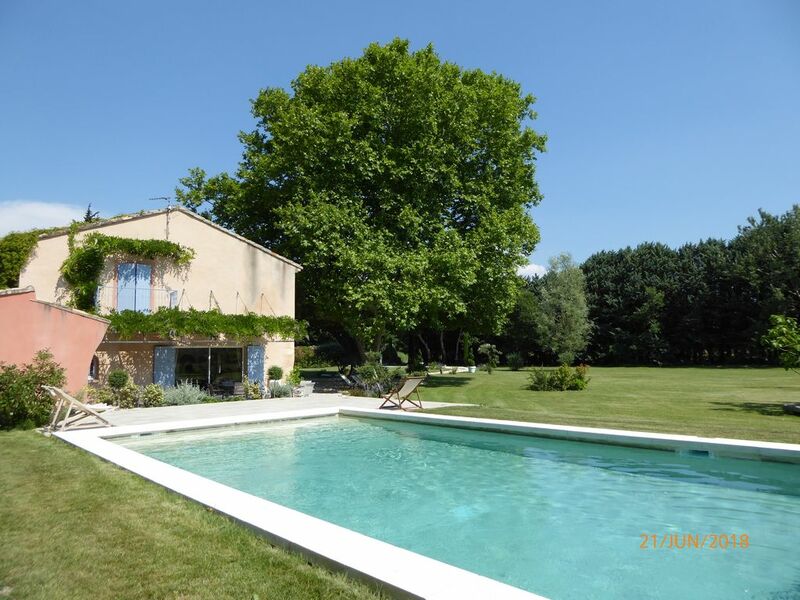 This Provencal farmhouse has been fully renovated in 2012 with traditional materials, secure private pool (10x5 m) with roller shutter. The property is located in the heart of Provence amongst countryside, ideally located 7 km away from Saint-Remy-de-Provence, 20 km from Avignon, 15 km away from Baux-de-Provence, 40 km from Lubéron, the sea is a 1h drive, all shopping facilities in the village at 2,5 km. The Provencal farmhouse offers 5 large bedrooms (approximately 20 m²), 2 double beds (160x200 cm), one double bed (140x190 cm),7 single beds (90x200 cm), a sofa bed for 2 people, 1 baby cot (changing table, high chair, potty-chair, bathtub), 2 restrooms, 2 shower rooms, 1 large arched living room, a kitchen with wonderful fireplace full of character. Roofed terrace and pergola covered with wisteria, shaded courtyard with a two hundred years old plane tree, everything on a ground of 5 acres. Monthly and weekly rentals are possible. My name is Marie-Noelle, and I love the good food, the human relationships, receive friends, go to the cinema, the hiking, and I love a good quality of life. During my free time, I love flip through magazines of decoration as well as geography. I don't have many opportunities to travel but I love cater the holiday makers because this way I can learn a lot, and thereby have relationships in the entire world. This Provencal farmhouse is a family Provencal farmhouse, where there are many good memories, and very good moments. I wish that the clients will spend unforgettable moments too. The Provencal farmhouse is located on a large plot, in the countryside, and is not overlooked; you will maybe have a feeling of fullness. You will also enjoy the bedding. Authentic villa with impressive pool and garden! It was a great home away from home for our stay in Provence. Everyone enjoyed the pool daily and there was sufficent space for the 13 of us to live and relax in the house. Many cute towns nearby. A large yard for the kids to run around in and a spectacular tree to lounge under on the sunbeds... Would love to return! Nous avons passé un week-end entre amis avec les enfants de 2 à 10 ans. Tout est très fonctionnel pour un séjour entre amis ou en famille. Piscine à bonne température avec sécurité par rideau flottant, zone très bien aménagée, les pierres devant glissent un peu, il faut éviter de courir. Jardin immense, beaucoup de transats. Ombre ou Soleil toute la journée grâce aux nombreux espaces et aux 2 terrasses. Les 2 chambres sous combles un peu petites et chaudes mais équipées de clim. Les 3 autres chambres sont très grandes et fraîches. L'intérieur est fonctionnel et la zone de vie est spacieuse. Distributeur de glaçons très agréable pour accompagner le rosé. Il ne manque que les boules de pétanque. Quelques jours de plus auraient été appréciés de tous. By A7 motorway, exit Avignon Sud, direction Salon. In Saint-Andiol, turn to the right at the traffic lights and then take the direction of Saint-Remy-de-Provence for 2 km. Airport of Avignon 20 minutes away. The airport of Marseille-Marignane is 90 km away from Provencal farmhouse. Avignon TGV train station, 20 min away (2h30 from Paris). You will find local food in Saint-Remy-de-Provence or in Alpilles (many leaflets on site).